Galimulator is a galaxy simulator, which allows you to watch the story of your little galaxy, as empires rise and fall. Simply watching what happens can be surprisingly addictive. You can also choose to participate, either by playing around in a pretty free sandbox, or outright playing an empire. There's a lot of stuff happening. You should be able to watch it without reading any documentation and just figure stuff out, but it might seem overwhelming, so reading through this page might be very helpful. In this mode, you simply watch to see what happens. See how the empires rise and fall, watch the ebb and flow of power in the galaxy. This is the default mode the game starts in, and all you need to do is sit back and watch, and everything will simply happen. You can still steer some ships around in this mode, and maybe do some other minor things, but in general you do not have a lot of power, and you should primarily be observing. To me I think it's a good starting point to get used to the simulation. Now, if you want to understand what is going on, maybe you want to start reading around here. In Sandbox mode, you now have basically free control to make almost any kind of changes and steer the development of the galaxy any way you choose. Paint empire control - So basically forcibly make an empire grow by dragging your finger (or mouse) over the screen to give each star you touch to this empire. Place totems - These items grant bonuses or malluses to the empires that control the star closest to them. I will not list all of them here. Spawn monsters! - Now these guys are usually not very helpful, but you can spawn as many of them as you like and see how the galaxy handles it. As with ships, you can only spawn monsters that you have unlocked! Monsters usually show up at random, or as Quest results, so keep an eye out for those. So finally, yes you can play the emperor of any empire you like. 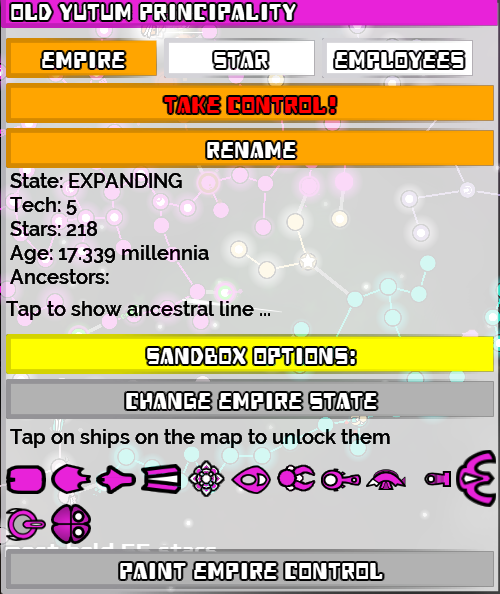 Simply tap on any star belonging to an empire, or on the empire name in the top list - and then tap the "TAKE CONTROL" button. Congratulations! You are now the emperor (or however you may want to style yourself) of a galactic empire! An Emperor can never do everything, but you can do quite a lot, below are some sections of stuff you can be doing. The spinning three-armed wheely thing is your Flagship (sorry I can not afford a graphics designer so you will have use your imagination on this one). Drag it around on the screen to make it move places, it does not even need to follow the starlanes. It will provide a bonus to any ground combat that goes on within the range of the circle, so it's a good idea to keep it around your frontier to maximize your expansion rate. It's also a decent space fighter of itself, and can help smack down some of those nuisance battleships and other hostile ships that are providing support for your enemies. And, since you can steer it around, you can also do some high-speed dodging of those missiles (won't work against lasers though). The higher level your flagship has, the better it is at providing ground support, and it can also absorb more damage. So needless to say, it's a good thing to keep it high level by destroying enemy ships. If destroyed, it will respawn again, but back to level 1. By default the AI will build ships for you, and it's really incompetent. If you like, you can take control of this by openining the Emperor Mode menu (it's at the top), and go tap "Ship Construction". Here you can see the capacity of your empire. If your capacity is at least one step higher than the current ship count (not the case in this image), you can build a new ship. First, choose a star where it will be built, and then simply tap a ship type to build it. Congratulations, you are now a factory worker! You have some options at your disposal regarding how to deal with your neighbours. By default, empires are very hostile against each other. There is no particular reason to like eather when you are both interstellar expanding empires bent on conquering the world. But you can always try, if you like. Make peace - Not always an easy job! Galimulator can optionally simulate some of the people (or whatever) who populate the galaxy. This allows you to follow families or individuals to see what happens to them. Read much more about them here: Dynasties! So what do the empires do? You will notice that every empire has a color (hopefully distinguishable from others), and every star that this empire controls also turns this color. Empires will usually try to expand their domain (though with varying levels of enthusiasm) by launching attacks at neighbouring stars. So every now and then, they will launch an attack, and there will be a combat roll between the two empires holding each star. The most important factor to the outcome is the tech level of the empire. If the attacker wins, the star is conquered. To help the war effort, empires will create various ships, that roam around in an attempt to be useful. If ships are stationed at stars where there is combat, they grant some combat bonuses to the empire that build them. When an empire has peacefully held a star for some time, the star will become "developed", indicating that it has reached some level of maturity. 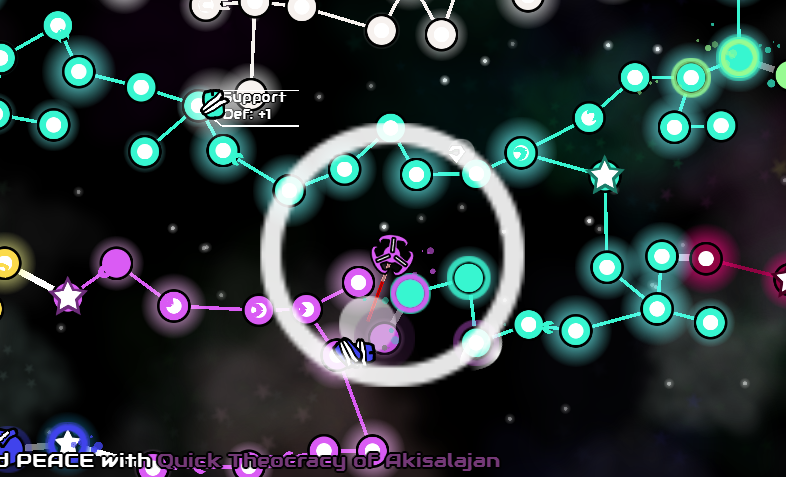 This gives it some bonuses (such as research and combat), and is indicated by a white circle in the center of the star. Attacks against a star will damage that development level. Often, an empire will entirely take over the galaxy. At this point, rebellions will be unlikely to harm it. But don't worry, there is no way it can stay on forever. It will either fall degenerate into oblivion, or transcend into some unimaginable paradise. New empires are born by (presumably) violent rebellions in existing empires, or by simply advancing the evolutionary ladder from so called "Neutral" stars (they look like hollow rings). Some rebellions will be just a single star, but others will bring in a bunch of other stars with them in an attempt to throw off the shackles of their previous regime. Most of the time, these rebellions will end in pitiful defeat at the hands of their masters. But if the master race isn't doing too well, or if they are very lucky, they will rise to be a major power in the galaxy. All empires will initially be EXPANDING state and seek to expand their empire. They also get the same (or a somewhat lower) tech level as their parents. 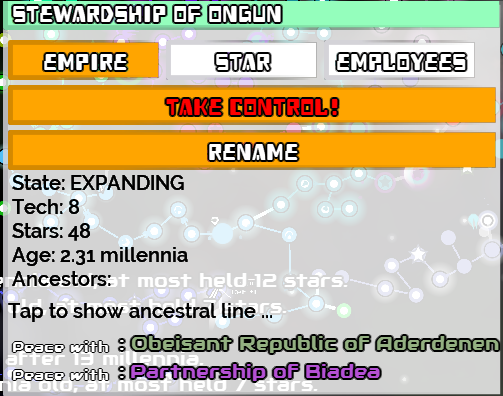 Empires are each given randomly generated names. These names do not have any impact on how the Empire actually behaves, but obviously reflect some deep element of the nature of this race and regime. At first glance, it may be surprising that an empire will title itself something like the Nauseating Nation of Ipizu. But this is really a great name if you think about it, I'd personally think twice about attacking these guys if I were a malicious alien race looking for a meal. I'd head over to the Delicious Dictatorship of Ucio first. And it may seem contradictory to find the Youthful Yglab Geriocracy rise to power, but there is no contradiction between being old and youthful. It's quite inspirational in fact. At the end of the day, they will always have a good reason for choosing this name, you just need to figure it out. So you are struggling pronouncing Hutuoyjgkafi? Admittedly it's not easy for me either, but that is obviously the name they have chosen for profound reasons. Perhaps this race simply isn't equipped with the same vocal apparatus that we are? Tolerance is a precious commodity in this galaxy. To reflect the internal state of the empire, each empire always has a high level state. This impacts a lot of things but most importantly how aggressively it attacks, how quickly it researches. Empires can change states every 1000 cycles (~1.5 minutes) and do so quite randomly. When an empire is EXPANDING, it will obviously try to expand it's borders, by attacking other stars. They do some research too. All empires start out like this, and it's usually pretty solid. When an empire is FORTIFYING, it is trying to solidify it's border and focus on internal development. They will still defend lost stars quite fiercely, but rarely (though sometimes) conquer new stars. Research will be about twice as efficient as an EXPANDING empire, and stars will develop faster. FORTIFYING empires tend to beat out EXPANDING empires if they are lined up against each other. But if they are both starting out with a lot of room, then obviously the expanding empire will grow much faster and probably even out-research the fortifyer and then quickly kill it. It's often an interesting fight. This simply indicates that the empire has had enough for some reason. It has lost the collective will to do anything useful. Maybe they are simply lazy after dominating the galaxy for hundreds of years, or maybe they are busy filing paperwork in an explosive bureaucratic nightmare. At any rate, DEGENERATING empires do not expand or defend lost territory. They do not research, and in fact they may lose technology (maybe the priesthood decide they don't like it). They also blow up artifacts left by ancient civilizations (or themselves). An empire may bounce back from this to fortify or expand, but they typically find that the galaxy is now filled with lots of small upstart empires that have eaten up most of their territory while they were on vacation. Oh, and those upstarts still remember how to build plasma guns ... Have you seen the blueprints for them lately? Well something is clearly going wrong now. Perhaps some scandal in the court has outraged the plebians to rise, or maybe it was the construction of that gigantic lunar monument with tax payer money that tipped people over the edge. In any case, every single star in the empire is now at grave risk of revoling to try their own hand at interstellar management. Those stars still loyal will bravely fight to get the empire back, but unless the prince apologizes for that faux-pas in the sauna, to stabilize the regime, their outlook is grim. This is a rarely seen thing, but it can be quite spectacular. For some reason, they have now decided that they have to rid the galaxy of all life, including themselves. Maybe they got really bored, or maybe it's just a bit of the old fhtagn! kicking in. They will launch a spectacular attack, boosted by their fanatic beliefs, in an attempt to conquer stars. But once a star in their empire has become developed, they blow it up ... Including of course any stars they own when they collapse into this state of mind. So the result is basically that they never have a core in their empire, they simply blow everything up and control only some stars in the front lines that they are continuously trying to expand. The vacuum left from their scorched space policy creates a great breeding ground for new empires. But of course, if the ALL_WILL_BE_ASHES empire finds it's way back, it will simply get more fuel to continue on with the rampage. This can go on for some time, like a wildfire constantly looking for new fresh worlds to conquer and blow up. Or it can just fizzle out very quickly, but usually it's quite fun to watch. There is no turning back from this state. Well family is always the worst, right? Empires who enter this state have simply decided that there'll be no more awkward family dinners or drunk cousins at weddings. They all have to go. Blood purgers will wage manic war against those who share a common ancestor with them, though be very reasonable with everyone else. They get a combat bonus, and are remarkably stable in that they simply want to end their bloodline once and for all. Wealth in Galimulator represents the amount of resources available to empires and stars. It's important to note that it does not represent personal wealth of the citizens in the empire, they may be brutally oppressed and have no money at all, but that doesn't mean that the ruling class can't afford to build that new temple. Wealth in this game is primarily created by Trade ships. Trade ships move around in the galaxy, from one interesting place to another. Every star they touch in between receives some wealth, and once they reach their end goal that star receives a lot of wealth. Wealth can also be created by a special artifact called Financial Center. You also receive some wealth if your neighbour star is wealthy, and correspondingly lose some, if you neighbour is poor. Wealth is consumed all the time, by a rate that is proportional to how wealthy a star is. In other words, rich stars spend more money than poor stars. This means that stars need a steady income of wealth to stay wealthy. So if that artifact is destroyed, then maybe in the long run that star will lose its income. Wealth is also lost in wars, so lots of fighting will tend to create poorer galaxies. So Star versus Empire wealth? Stars have an inherent wealth, which is affected by what you have read above. An empire's wealth is simply the average of the wealth of all stars in that empire. This is likely to change quite rapidly as I develop the game, but it is mostly a good thing to be wealthy. For instance, wealthy empires receive a bonus to all combats. This means that small wealthy empires have a good chance of standing up to large but poor empires. Over time empires will try to advance in technology, at least as long as they are EXPANDING or FORTIFYING. Every developed star in an empire can come up with a technological advance, and a nice white aura effect and a bulletin will let you know when that happens. The technological level of an empire has the primary effect of making it better at fighting. A tech level gap of one is usually significant enough to determine the long term result of a war, so this is really important. Research gets harder the higher your current tech level is, so the step up to level 4 is actually twice as hard as the step up to 2. Once an empire reaches level 9, it will become TRANSCENDING and simply leave the galaxy to somewhere probably wonderful, never to be seen again. Empires will build artifacts that can stick around long after they themselves have gone, perhaps providing them that critical defensive bonus needed to fend off the attacking hordes, or maybe just a nice photo-op. They are not loyal to their creators in any way, and if conquered the new owners will make use of it. Each empire can build only one artifact each, and can only do so after having been around quite a while in the galaxy. There can also be at most one artifact per star. Artifacts can be destroyed, if the empire holding it becomes DEGENERATING (or even ALL_WILL_BE_ASHES). Maybe because they just got tired of it, or want to recycle it to build a new summer space station for the emperor. It's a good thing though, since otherwise the galaxy would quickly become riddled with old junk. This gives a significant boost (equivalent to 2 tech levels) for attacks either against this star itself, or attacks from this star to an adjacent enemy star. It also triggers a fancy animation. This temporarily (on average about half the time) disrupts the wormhole connecting this star to neighbours. This means that it is protected from attacks (though not empire-wide events), and also that it can not launch any attacks. It can also have the interesting side-effect of splitting up the galaxy into different isolated parts, which can have some nice effects. This is just an ego-boost for the ruler of the empire, but has no in-game effect (though I have some ideas!). This artifact makes the planet research at a massively increased speed. This station launches devastating missiles at enemies. If the missile hits it will always destroy the target, regardless of tech levels. This station will launch small Interceptors that go after enemy spaceships in the area. The ships replenish over time if they are lost, and yeah they usually are. Life as a fighter pilot in Galimulator is not a safe career path. Sometimes empires do sign peace treaties with each other. A bulletin will let you know when this happens, and also the border connecting the empires will become thicker and brighter. Empires who are FORTIFYING are by far the most likely to sign peace agreements, and usually with each other. Sometimes they will coax EXPANDING empires into signing one with them. And perhaps once in a blue moon expanding empires will reach some tentative and short-lived agreement, probably due to a clerical error or some misunderstanding. All treaties can be broken, and expanding empires will to do so much more often than fortifying empires. One special case here is how empires treat other empires who are far higher up, or lower down the tech ladder. Those will generally try to be friendly with each other, to maintain some semblance of dignity. There may be some faux-pas though, resulting in the annihilation of some smaller, low-tech empires, but they make a best effort to avoid it.